To start, let’s just consider the left page. There are a couple of interesting features to consider if encoding this text. Most obviously, there is the overlapping content in the top right corner. (This is repeated on other pages – but it is specific to this poem.) What exactly would you tag the non-traditional text? Where would it be sequenced in relation to the standard column of poetry? Before? After? What about the issue of legibility? As discussed in class, the detail of classification of the tags – as well as the amount of effort one might put into specifying a particular feature – might depend on the audience. Another key consideration would be how much time a scholar has to encode a text. If this were part of a well-funded project that expects the most detailed possible encoding work, than more specificity and consideration could be applied to this feature. 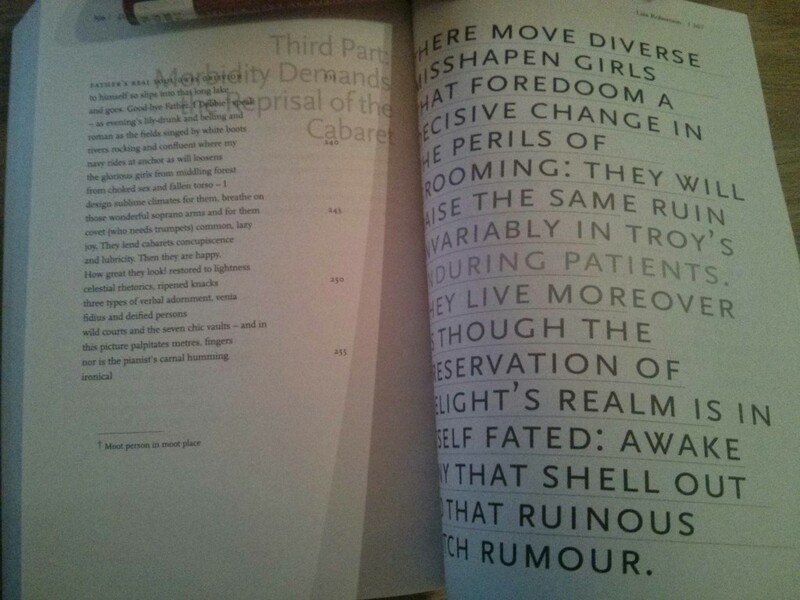 Other notable features are the line numbers (which are specific to the poem, not the anthology) and the dagger footnote. For the line numbers, how would you make it clear that these are an integral part of the poem rather than an editor’s addition? For the footnote, is the shape important? Indeed, these are the kind of questions that make applying TEI as tricky as the text at hand. Robertson, Lisa. “Debbie: An Epic.” In The New Long Poem Anthology, edited by Sharon Thesen, 347-371. Vancouver: Talonbooks, 2001.